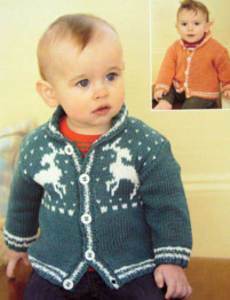 Cardigan, plain or with motif, main colour: 41cm 3 balls, 46cm 4 balls, 51cm 5 balls, 56cm 6 balls, 61cm 7 balls, 66cm 9 balls. Plus 1 ball contrast. 50g balls Sirdar Snuggly Baby Bamboo DK. Dk tension 22st/ 28 rows to 10cm, 4mm needles. Shown in Baby Bamboo (main photo shade 163, smaller 166, both with 131 contrast): also suitable for Sirdar Snuggly DK, likely to require less yarn. 3.25mm and 4mm needles. Buttons 41-51cm 5, 56-66cm 6.